Split Mountain is located within Dinosaur National Monument near Vernal, Utah. We ride to the top (about 7600 feet) at least once every year. Google Earth provides a view of our trail (in blue). As you can see, the mountain is split by the Green River passing through. The photo above, taken from the top, looks down on the river as it passes through the split. We ran into snow patches in the Ponderosa pine forest that starts a few hundred feet from the summit. We forged ahead. To the northwest, the Uintas loomed. The view to the northeast looks down on the meandering path of the Green River after it passes through the mountain and into the Uinta Basin. Here's a panorama of the scene to the east, looking toward the mountains of Colorado. We had a great ride, about 14 miles with 2700 feet of elevation gain and loss, completed in about 2.5 hours of working time. We were moving fast, but the horses are in great condition and didn't seem to mind. Daisy had to stay home, poor girl. No dogs are allowed in the Monument. Some days it's hard to tell the season. Irrigation water is running, indicating the start of spring runoff, but the spray ices the grass each morning. The birds are wearing bright breeding colors. Surely the frosty mornings won't be with us much longer. *I've been away for a few days and I'm still trying to get back in the swing of things. I'll be back to regular posting and visiting soon. Every time we ride on Little Mountain, we try a slightly different route. This time, we went over a pass to an unnamed spring. On the way we had a nice view (above) of Red Mountain, north of Vernal, with the snow-capped High Uintas in the background. On the way down, we had a hazy view of the Uinta Basin. Little Mountain has its own share of red hills. Some of the hills have layers of red and green. Above, in the center of the photo, you can see the steep dirt track we followed. I've put a green pointer to show the meadow where our trailer was parked, still a long way away. Sure is a lot of space out here. At least Grandpa isn't completely in the Dark Ages. He has a Smart Phone to play with. And Grandma found me some cool toys. This country living is okay with me. Little Mountain is a favorite spring ride that's close to home. Our trailhead is at about 6000 feet elevation in a huge meadow. The BLM has planted the meadow in crested wheat grass, a non-native bunch grass that does very well here. Overgrazing wiped out the native grasses, so at least this provides a reasonable substitute, used because it's easier to cultivate than the native grasses. On a recent trip to Ouray Wildlife Refuge, we spotted this osprey hanging out atop a telephone pole. He was savoring his meal. A fish from the Green River? The osprey is sometimes called a sea hawk or fish eagle. His diet consists almost exclusively of fish. His eyesight is well adapted to seeing down into the water from above. Prey can be sighted from as high as 130 feet. He hovers, then plunges feet first into the river or lake to catch his supper. Osprey usually mate for life. Their typical lifespan is 7 to 10 years. We drove out via Hans Flat Road, making a few stops to admire the views. Toward the LaSal Mountains, above. Toward the cliffs near Robber's Roost. And a panorama of the Henry Mountains. Goodbye to Canyonlands for now. We'll be back. Since we could not complete our loop ride the previous day due to steep sandstone in our way, we rode to the place we had planned to come out (had we been able to continue) to see if we could find a route from that side. Steve studied the map and the terrain we would have to cross to reach yesterday's turn-around point. We did see some not-too-smart burro trails, and eventually Steve began to recognized signs left by cowboys and/or outlaws pointing to a route. They didn't use cairns; they used dead juniper trunks and branches that could easily be dragged into place and could be seen from a long distance. Above, an axe-cut juniper trunk points out the direction of the trail. Other times, limbs on either side mark the way. The indicated path led to a steep sandstone path that burros had been using. It probably was do-able on horseback, if one was willing to risk life and limb of horse and rider. We weren't willing. If our livelihood depended on it, or if the high sheriff was hot on our heels for our latest train robbery (as might have happened to the early residents of Robber's Roost), maybe we would have taken the leap, so to speak. We may be a little crazy, but this is just recreation for us, after all! Note to PAULA, who asked about rides in the San Rafael Swell: I answered you via the comment section on the posts you addressed. I don't have your email address to reply directly. The night after our Long Day, the wind blew. Hard. I'm guessing gusts to 40 MPH. We could hear it building several canyons away, working up steam, creating a crescendo that rocked the trailer when it hit. The horses had no good break for what became an increasingly icy wind, so when the wind failed to let up a few hours after dark, we put them in the trailer for the night. Finally, all of us got some sleep. The next morning, the thermometer we keep in the tack room read 17degrees F! Wait, wasn't this supposed to be southern Utah? Apparently, someone was confused. By 9AM, the day had warmed up to slightly above freezing. The blue grama caught the morning light. The curled seedheads might be why the cowboys call it curly grass. Or maybe it's because the grass blades near the ground tend to curl. Daisy soaked up some rays. When we started saddling for one more ride, she hung out almost under Boss's feet, doing her best to make sure she got to go with us. She hates to be left behind. However, she was still tired from the previous day and we didn't think her paws could take any more sandstone. So, much to her regret, we left her in the trailer and took off for another few hours of exploration in canyon country. In slickrock country, you have to take advantage of breaks in the sandstone wherever you find them. I'm eyeing the path Steve has chosen, getting ready to lead Boss down. He's impatient and climbs out on the ledge. "No, Boss." "Go this way." I toss the lead rope over his back and let him proceed, since I don't want to get run over as he eagerly heads for his companion. Now, if I can just get down without breaking something vital, we'll be on our way! After re-visiting Cowboy Cave, our plan was to continue on in a loop through the Upper Pasture (about 2 square miles in size), over some hills, and back to the trailer. 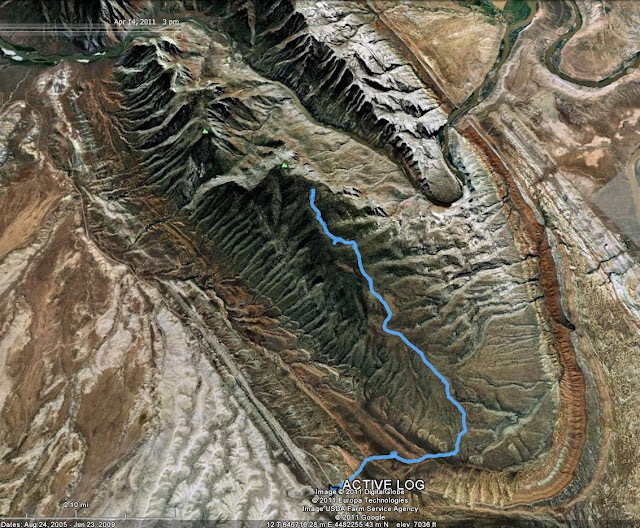 The entire loop was supposed to be about 14 miles. We made the trek through Upper Pasture (above) okay. Daisy enjoyed a little shade wherever she could find it. After that, we had a few difficulties, however. Such as, the "hills" turned out to be solid sandstone, too steep for the horses. If we could have found a path with soil, the climb would have been fine, but that slickrock just wasn't do-able. While hunting for a route, we often came to cliffs we couldn't climb. In the photo above, a cliff provided a pour-off and a pool to water the animals. Even Coco was thirsty enough to brave the deep, wet, sucking sand to get himself a good drink. Finally, we realized we weren't going to find a route in time to get out of the canyons before dark. Having come within a couple of miles of completing the loop, we had to re-trace our steps, making the ride 24 miles instead of 14. Big diff! Almost back, we passed this intriguing juniper corral, still in good shape. We made it to the trailer an hour before sunset.